Quick response rates for flatbed towing in San Diego. Ever waited too long or dealt with unprofessional towing? Mission Valley Towing can assure your RV is towed with the required tools and the attention to detail your RV towing service requires. We don’t fit the profile for other typical towing companies that are limited to offering the most tedious and expensive towing services, we make our customer service a priority and educate you and show you how we know the best way to handle your vehicle towing efficiently and secure. Call us or email us to find out what you need to keep in mind for the day you need your RV towing service and that way you are prepared and also know what to expect from the company you hired. We are experienced with towing of Recreational Vehicles, Campers, RVs, Boats and any other kind of trailers. 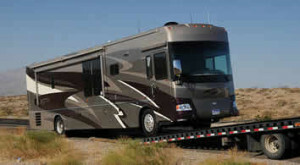 Call now and get a friendly and professional towing company for your RV.